Is it Possible to Keep on Giving Always? Materialistic life is all about what you get whereas spiritual life is all about giving. Receiving gives you pleasure and self-actualisation, but it can also give rise to lust, expectations, greed and control. On the other hand, giving opens up your heart, makes you generous and lets you realise the divinity within. But it can also give rise to expectations, a fear of not receiving in return, or a fear of giving too much. So finally what is better – giving or taking? You should know that you are not the body, mind or the senses. You are the soul. Giving or taking doesn’t belong to you. You are neither the givers nor the receivers. Your true nature is only Being. As the Being, your qualities are power, creativity, wisdom, generosity and contentment, among others. Hence, whether you are giving or receiving depends entirely on the situation in the Now. 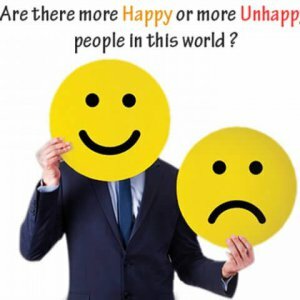 Are there more happy or more unhappy people in this world?